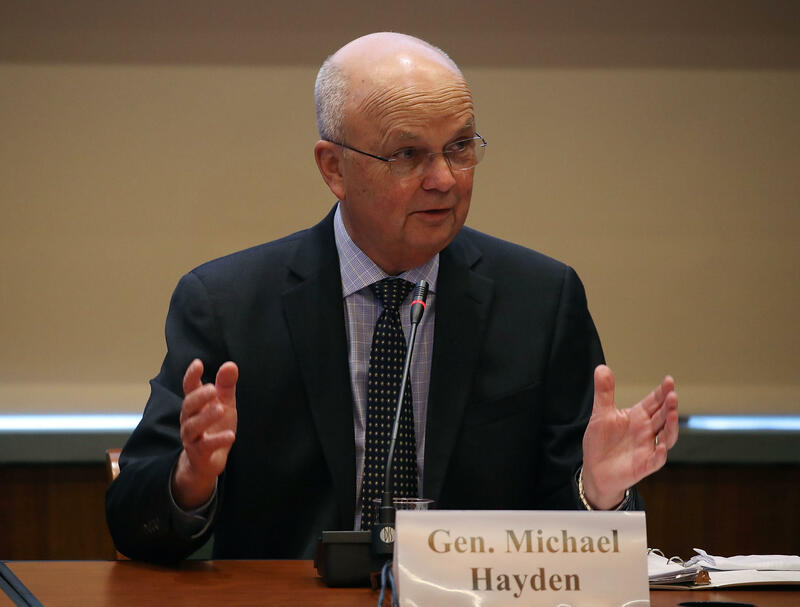 Former CIA and NSA Director Gen. Michael Hayden said that he's troubled that the investigations of Russia's meddling in the 2016 election appear to be playing out in a "political lane." Hayden, speaking to the National Academy of Sciences' meeting on the future of voting in the U.S., called the Russian's interference a form of "honorable international espionage" that was "dramatically weaponized." Other nations, including the U.S., have attempted similar tactics but have never taken aim at a Western or developed democracy, Hayden said. "We've never been this successful," said Hayden of the cyber threat, adding, "This was incredibly well done -- in which stolen data was pushed back into the American information space in an impressive operation." He said however, that while ongoing investigations continue to unfold on Capitol Hill and the criminal investigation is being led by Special Counsel Robert Mueller, the issue has become too politicized, and he fears something more important than the outcome of the investigation may be lost. "I'm not interested in crime, I'm interested in the story and the narrative," said Hayden. He added, "I do have fear that we will not get the richest explanation of the narrative because within the executive branch at the political level...getting at the narrative is not a high priority." Hayden, directing his comments toward President Trump, who has repeatedly considered the probes to be "fake news" or a "hoax," said the president "thinks its about him." "To the degree we can convince this is not about him -- he is the legitimate president of the United States, and no one's questioning that -- this is about us," said Hayden. He added, "The more we can create that story, the better off we'll be." In Hayden's view, it is incumbent upon "evidence-based institutions" like the press to provide a public reminder that there's more to the story about Russia's role in the election. When asked why Russia wanted to do this in the first place, he said they did so to "de-legitimize the inevitable Clinton presidency," and later "moved their efforts to move the votes in direction of that preferred candidate. " While he is "certain" what the Russians did affected the 2016 election, he said there was no way of judging how much impact it really had. "The more we learn about this," said Hayden, referring to recent efforts to turn over social media data and targeted ads from Twitter and Facebook, "the more sophisticated this appears." He said overall, the Russians, particularly President Vladmir Putin, felt compelled to follow through with the tactics because it had to do with "Putin's social contract, not with Trump's." "He [Putin] wants to be somebody. He wants to sit at the big people's table," Hayden argued. "There is a sustained campaign on the part of Putin's Russian Federation to discredit the countries and institutions at the big people's table," he said, adding, "That's why he pokes at Brexit, he pokes at NATO unity, pokes at the European Union and why he tries to discredit the American election. He wants to bring us down to his level."